Since the classical era in Japan, many local belief systems have been tied to the idea that special gods preside over the fortunes of the rice fields. These gods shelter themselves in the mountains during winter and come out into the world in spring to hold watch over the plants' growth and insure an abundant harvest. 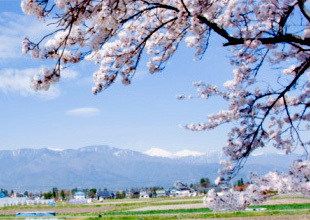 When they descend to the villages, the gods are thought to harbor themselves in cherry trees; the blooming of the cherry blossoms heralded the arrival of the gods, and signaled the beginning of rice-planting season. People developed rituals in order to inspire the gods of the fields to insure a rich harvest. For instance, at the beginning and ending of their planting, people offered to them seedlings bundled into threes; and when harvest took place they would cut and lay bundles of new rice in a special part of the field as a tribute. A whole array of ritual practices and festivals developed as both celebration and tribute to the gods of the rice fields. Rice cultivation has produced not only staple foods for everyday life and rituals, it has also become intertwined with traditional cultural production. Festivals that celebrate the bounty of the rice harvest and all the processes of its fruition take place in local versions all over the country, in addition to being part of the rites of the imperial household taking place throughout the calendar year. This "first taste" is an annual ceremony offered by the emperor to the gods in the fall as a way of marking the rice harvest and the forms it has subsequently taken, such as sake. In classical times the ceremony took place on the day of the rabbit in the eleventh month of the lunar calendar. On the first occasion after the emperor ascends the throne the first taste ceremony goes by the special name of the Daijōsai. A festival in celebration of a bountiful harvest. Girls acting as conduits to the gods cut off only the heads of the rice and offer them to the gods. The invisible spiritualism and power of the rice and are acted out in the form of a one-person sumo contest, in which the never-vanquished sumo wrestler demonstrates how the spiritualism of rice bolsters this effort, while giving thanks to the gods who enabled it to grow into a bountiful harvest. In this festival participants cut handfuls of ripened grain as an offering to the gods. It's also known by the name "procession of the fox-spirit bride," because a man and woman dramatize the bridal procession of the fox spirit, the deity of the folkic inari Shintō sect, by wearing fox masks and riding in a rickshaw to town, as an offering to the gods. This is the oldest rice-planting festival in Japan and is devoted to praying for a rich harvest when rice-planting actively starts. Dancers mime farming tasks such as plowing the fields with oxen as they took place in the past. Women playing the role of "ueme" planters put seedlings in the ground that have been ritually purified. The dancing that follows ascribes power to the seedlings so that they may thrive in the future. This festival is devoted to the dance version of the sowing and [planting of rice as stylized movements are transposed from the task of rice-planting into an art form that asks the gods for the blessing of a bountiful harvest. Hachinohe's version is a boisterous dance called enburi, a local agricultural tool that farmers used to carry. The dancers wear hats resembling horse-heads while dancing with large curving hand movements. Each summer this hot springs town hosts a festival that asks the gods of the skies for their continued beneficence in the form of water. The main event is called "Take no nobori," or a procession up a mountain peak waving bamboo poles decked with colorful streaming banners. In time with the music of flutes and drums, brightly garbed children dance the sasara dance with bamboo percussion instruments and a "three-headed lion" dance. Some of the most notable Japanese folk arts in Japan have sprung from rice festivals as they have emerged over the years. 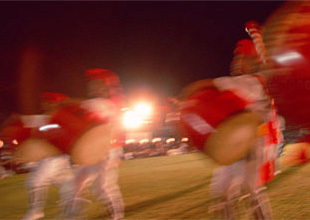 The field drama called dengaku, musical accompaniment to rites of rice-planting, is said to come from playful field rituals with drums, song and dance that were performed just before planting. This dance was imagined to inspire an abundant harvest. The Japanese national sport of sumō was also originated as an offering to inspire an abundant harvest. When the wrestlers enter the ring, they stomp each leg up and down dramatically. This gesture connects the wrestler elementally to the earth and is imagined to ward off disasters like pests and fires as well as urge the presiding rice gods not to abandon their watch as the rice grows. In these ways, rice connects intimately to daily life now as it did in the past. COPYRIGHT © SHINMEI CO.,LTD.ALL RIGHTS RESERVED.